What do government people think that the Office of Management and Budget can do to get things done in the next 18 months? In a very Web 2.0 way, IRMCO organizers earlier this month sought to tap into the wisdom of crowds. Conference organizers had people sign up for tables. At each table, a senior government official served as a moderator. Moderators included Karen Evans, OMB’s administrator for e-government and information technology; Robert Shea, OMB’s associate director for management; and David Wennergren, the Defense Department’s deputy chief information officer. Shea introduced the session by saying that OMB was looking for insights — the wisdom of crowds is our phrase, not his — into what OMB could do in the next 18 months to help agencies deliver results. It was an innovative and refreshing approach to business, and some valuable ideas came out of it. Here are some of the thoughts and suggestions people offered on various topics. Improve communication among federal, state and local governments and tie funding to performance metrics. Ensure that the goals and objectives of policies and guidance always filter down throughout an organization. Otherwise, there are disconnects between reporting on program performance and program implementation. Ensure that all team members understand what the strategic plan is and get commitment from the top. Emphasize collaboration on three levels among the management team, program managers and outside interests. Implement a competency-based human resources strategy for finance, IT, acquisition and human resources managers. Enable a more flexible allocation of resources among agencies and programs. Ensure that people in critical positions have appropriate certifications. Recruit new people to federal government service at all levels. Streamline hiring procedures to ensure the government can recruit necessary talent. Harmonize goals and objectives across government. Example: Many agencies work on water management, but they may not have common goals. Develop performance measures and ensure that outcomes are aligned with those measures. Develop common metrics for programs and benchmark those against industry benchmarks. 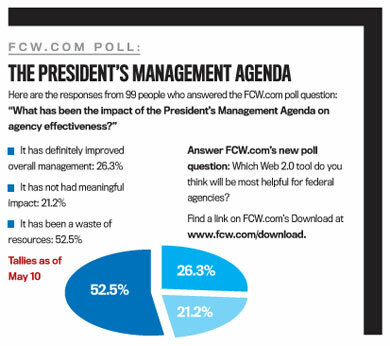 Revamp the President’s Management Agenda score card. The federal government should consider branding. We should have a citizen score card because citizens are stakeholders. The score card could measure e-government initiatives, customer satisfaction and usability, for example. Continue and accelerate the consolidation of services. Look at industry return on investment, standards and best practices to ensure service goals and measures are developed in line with those. Promote the use of integrated project teams with participation from management and employees. Improve processes and integrate and align the evaluation of program effectiveness and corresponding reporting requirements.